Trinity Designs: Jackets Can be Inspiring! A few weeks ago, I received an e-mail from one of my favorite stores, Coldwater Creek. (Hi Patty!) There was a jacket advertised which had a pattern that just screamed "make me into a card". You can see the original jacket here. So, I finally got around to making my card last night and this is the result. I'm most excited about the gathered ribbon around the greeting, because I figured it out all by myself. It was very easy once I put enough adhesive on the back to hold it! LOL! I started with a card base of Creamy Caramel cut at 4 1/4" x 11", folded in half lengthwise. It's layered with a piece of Basic Black, 4" x 5 1/4" and the stamping was done on a piece of Whisper White cardstock cut at 3 3/4" x 5". I first ran the White cardstock through my Big Shot with the Texturz plates as it mimics the texture in the jackets' fabric. Then I took out on of my favorite stamp sets, Stitched Exotics (which is RETIRING this month!) to attempt to mimic the jackets' pattern. I stamped my images in Basic Black, Tempting Turquoise and Creamy Caramel. I love how the texture shows though the stamping especially in the large flower. 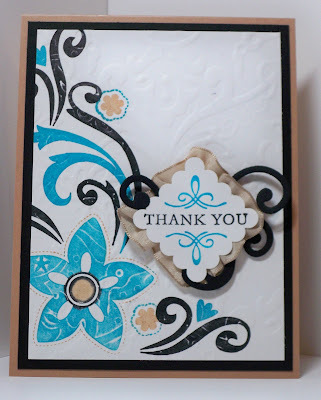 To create the medallion, I stamped the Thank You individual stamp using my Stampin' Write Markers in Tempting Turquoise and Basic Black. It is punched out with the Scalloped Square Punch. Then I covered the back in SNAIL adhesive and taking my Kraft Taffeta Ribbon, began to gather it in small increments all around the perimeter of the square, sticking it down as I moved around. Then, to finish it, I ran the Swirls Scribbles Sizzlits Die through my Big Shot with Basic Black Cardstock and added two of the swirls to the edges of the medallion with more SNAIL. Lastly, I punched out a 1 1/4" Square of white cardstock and adhered it to the back to secure everything. It is mounted on two Stampin' Dimensionals to give it height. To be honest, I'm not completely in love with this card, but my husband and daughter both had the right answer when I asked their opinion! Hahaha! They said it was beautiful and a great interpretation of the photo. So, what do YOU think? Let me know by leaving a comment, I'd love to hear your feedback or if you have another way to interpret the photo, please take a picture and link it back to this post. Everyone sees things with a different set of eyes. That's one of the things I love about stamping! If you haven't checked it out yet, you should! We on the design team have a different sketch challenge each week and would love for you to play along with us! Great creative interpretation! !Although I seldom actually purchase Coldwater clothing, I keep those catalogs coming for the bold color and design ideas for stamping...they are combos that help me color outside the lines.